Joseph Morales and Nik Walker return to Utah to perform in the revolutionary hip-hop musical. (Courtesy photo by Joan Marcus) Joseph Morales and Nik Walker play Alexander Hamilton and Aaron Burr in the Phillip tour of t... (Courtesy photograph by Joan Marcus) | Nik Walker as Aaron Burr on the Phillip tour of the musical Hamilton, which will play ... (Courtesy photograph by Joan Marcus) Joseph Morales and Nik Walker lead the second national tour of Hamilton as Alexander Ham... (Courtesy photograph by Joan Marcus) Ta'Rea Campbell as Angelica Schuyler, Shoba Narayan as Eliza Hamilton and Danielle Sostr... (Courtesy) Actor Nik Walker plays Aaron Burr in the touring musical Hamilton. (Courtesy) Joseph Morales will play Alexander Hamilton in the Salt Lake City tour run of the musical Hamilton. (Courtesy Pioneer Theatre Company) Nik Walker as Tom Collins with Jason Gotay as Angel Schunard in Pioneer Theatre Company's ... (Courtesy Pioneer Theatre Company) Nik Walker as Tom Collins in Pioneer Theatre Company's 2011 production of Rent. (Courtesy Pioneer Theatre Company) Joseph Morales as of Usnavi, a role Lin-Manuel originated, in Pioneer Theatre Company's 2... Hamilton (Courtesy photograph by Joan Marcus) Shoba Narayan as Eliza Hamilton with Joseph Morales as Alexander Hamilton in th... (Courtesy photograph by Joan Marcus) Joseph Morales as Alexander Hamilton and Marcus Choi as George Washington in the nationa... (Courtesy photograph by Joan Marcus) Joseph Morales as Alexander Hamilton, with Nik Walker as Aaron Burr in the second nation... (Courtesy photograph by Joan Marcus) Elijah Malcomb, Joseph Morales, Kyle Scatliffe and Fergie L. Philippe in the cast of the... (Courtesy photograph by Joan Marcus) Jon Patrick Walker as King George in the Philip tour of Hamilton. (Courtesy photo by Joan Marcus) Joseph Morales and Nik Walker play Alexander Hamilton and Aaron Burr in the Phillip tour of the Tony Award-winning hip-hop musical, Hamilton. (Courtesy photograph by Joan Marcus) | Nik Walker as Aaron Burr on the Phillip tour of the musical Hamilton, which will play Salt Lake City April 11-May 6. (Courtesy photograph by Joan Marcus) Joseph Morales and Nik Walker lead the second national tour of Hamilton as Alexander Hamilton and Aaron Burr, which will play Salt Lake City's Eccles Theater April 11-May 6. (Courtesy photograph by Joan Marcus) Ta'Rea Campbell as Angelica Schuyler, Shoba Narayan as Eliza Hamilton and Danielle Sostre as Peggy Schuyler/Maria Reynolds. (Courtesy) Actor Nik Walker plays Aaron Burr in the touring musical Hamilton. (Courtesy) Joseph Morales will play Alexander Hamilton in the Salt Lake City tour run of the musical Hamilton. (Courtesy Pioneer Theatre Company) Nik Walker as Tom Collins with Jason Gotay as Angel Schunard in Pioneer Theatre Company's 2011 production of Rent. (Courtesy Pioneer Theatre Company) Nik Walker as Tom Collins in Pioneer Theatre Company's 2011 production of Rent. (Courtesy Pioneer Theatre Company) Joseph Morales as of Usnavi, a role Lin-Manuel originated, in Pioneer Theatre Company's 2012 regional premiere of Miranda's Tony Award winning In The Heights. 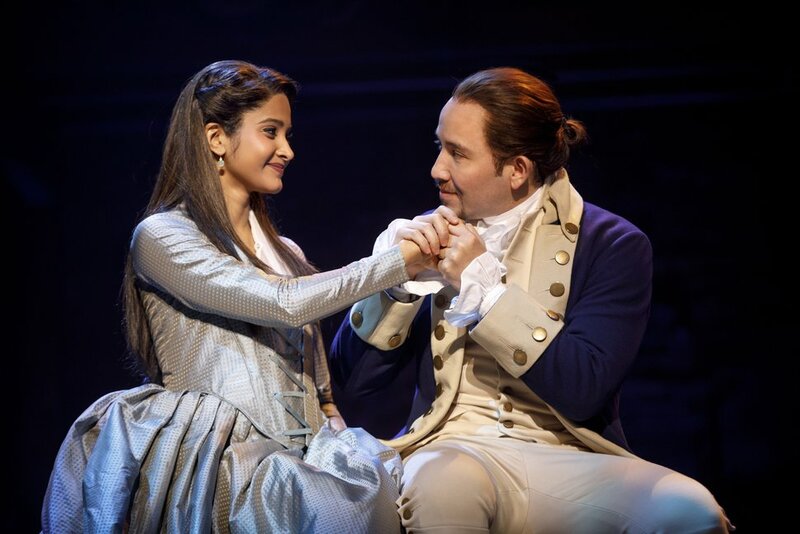 Hamilton (Courtesy photograph by Joan Marcus) Shoba Narayan as Eliza Hamilton with Joseph Morales as Alexander Hamilton in the second national cast of Hamilton. (Courtesy photograph by Joan Marcus) Joseph Morales as Alexander Hamilton and Marcus Choi as George Washington in the national tour, which will play Salt Lake City April 11 through May 6. (Courtesy photograph by Joan Marcus) Joseph Morales as Alexander Hamilton, with Nik Walker as Aaron Burr in the second national tour of Hamilton, which plays April 11 through May 6 at downtown's Eccles Theater. (Courtesy photograph by Joan Marcus) Elijah Malcomb, Joseph Morales, Kyle Scatliffe and Fergie L. Philippe in the cast of the Hamilton Philip company, the second national tour. 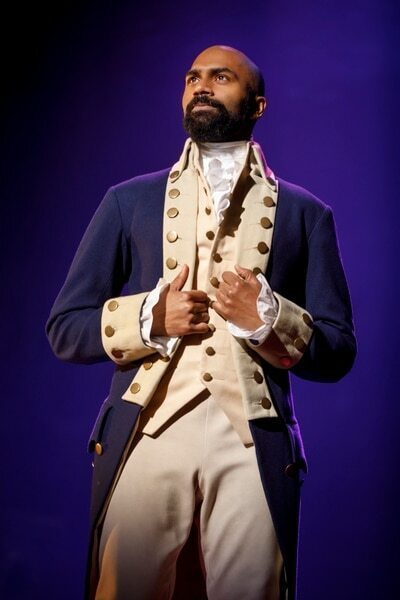 (Courtesy photograph by Joan Marcus) Jon Patrick Walker as King George in the Philip tour of Hamilton. Nik Walker wasn’t fond of “Hamilton” at a time when everybody else was in love with the century’s most groundbreaking piece of theater. Walker, who received classical Shakespearean training while studying at New York University, eschewed hip-hop for rock. “ ‘Rent’ was more my speed,” he says. A similar attitude, perhaps, to founding father Aaron Burr, Walker’s character in the second national tour of “Hamilton,” which plays its first Utah run at the Eccles Theater in Salt Lake City on April 11-May 6. In the role, Walker’s Burr matches political wits with upstart immigrant Alexander Hamilton, portrayed by Joseph Morales. It’s the story of two Founding Fathers whose fates became intricately entwined. He says you can tell a performer wrote the role, because it’s so much fun to play. Before the “Hamilton” run begins, Utahns are invited to meet Walker and Morales at a Tribune Q&A on Monday at the Grand Theatre in Salt Lake City. Joseph Morales, who plays Alexander Hamilton, and Nik Walker, who plays Aaron Burr, will share behind-the-scenes stories with Tribune arts writer Ellen Fagg Weist. The Tribune event, with a Q&A, will be at 7 p.m. Monday, April 9, at the Grand Theatre, 1575 S. State St., Salt Lake City. Tickets are $20 ($12 for Tribune subscribers). Visit https://bit.ly/tribhamilton for tickets and more information. Through the off-Broadway and Broadway runs of “Hamilton,” Walker auditioned eight or nine times with multiple callbacks. When the show blew up, “everybody was loving it, and I hated it,” says Walker, who worried he didn’t have enough energy to be cast in the hip-hop musical. It wasn’t until a friend advised him that the rap lyrics were just heightened verse that he found his way into the role. (Courtesy photograph by Joan Marcus) Nik Walker as Aaron Burr on the Philip tour of the musical "Hamilton," which will play Salt Lake City on April 11-May 6. Walker says he appreciates Utahns’ enthusiastic response to the arts, which he witnessed at Pioneer and on previous tour stopovers. PTC artistic director Karen Azenberg, who directed Walker in “Rent,” praises his intuitive gifts and his generosity as an actor. “That summer doing ‘Rent’ was one of the greatest gigs of my life, because of the confluence of super-talented people, and super-good people, and good-hearted people,” Walker says, adding that he’s looking forward to eating at The Pie and other favorite Salt Lake City haunts. Whenever he’s between roles, he asks his agent what’s going on at Pioneer, because he loves the theater company and its location at the foot of the Wasatch Mountains. Morales, 35, grew up in a military family around the country, living in Virginia and Texas and Hawaii. As a super-shy new kid, he discovered theater and school choirs as a way to make friends. His ethnicity is Mexican, German-Irish and Japanese; in Hawaii, he was cast in white roles. When he moved to New York and began auditioning, he was shocked when he wasn’t seen in white roles. Springville High graduate Thayne Jasperson originated the role of British loyalist Samuel Seabury on Broadway and is still in the cast. Joseph Morales played Usnavi to Anthony Ramos’ Sonny in 2012’s “In the Heights.” Ramos went on to originate the role of John Laurens/Philip Hamilton in the off-Broadway and Broadway runs of “Hamilton,” and at 24 was the youngest member of the cast. Jen Sese, from Pioneer’s 2009 production of “Miss Saigon,” is in the ensemble of the Salt Lake City touring cast and understudies the roles of Eliza and Angelica Schuyler. Also in the ensemble is Tia Altinay, a Brigham Young University graduate. In “Hamilton” tour rehearsals, Walker and Morales quickly became onstage brothers. “We both had an understanding we wanted to explore these men as friends” in the first act. One moment that reveals that choice is when Burr toasts Hamilton’s wedding to Elizabeth Schuyler. It’s an illustration of the choices actors in all five “Hamilton” casts are encouraged to make to reinvent their characters, even as they perform the same choreography and the same lyrics. At a recent Salt Lake City speech, Miranda praised the strength of Walker and Morales’ touring cast, known as the Philip tour. “Dramaturgically speaking, ‘Hamilton’ is tricky,” Miranda told the Salt Lake City audience, as Hamilton and Burr’s rivalry didn’t fit exactly into theatrical templates. It wasn’t until he discovered the men’s contrasting temperaments that he was able to unfold the story. Hamilton, an immigrant who was orphaned at a young age, threw himself forward recklessly. He didn’t want to run out of time. Burr, born to a privileged American family, was also orphaned at a young age, which made him cautious. He didn’t want to make a mistake. “It’s messed up, man, and it’s also fascinating,” Miranda said of his characters. ”Hamilton” is an incredibly demanding show to perform — physically, emotionally and mentally exhausting. Walker says he feels as if he has been hit by a Mack truck after each show. After all, ethnic actors are rarely considered to play leading roles in musical theater. And every “Hamilton” cast looks different, as each cast features actors of different ethnicities portraying American revolutionaries. (Courtesy photograph by Joan Marcus) Shoba Narayan as Eliza Hamilton with Joseph Morales as Alexander Hamilton in the second national cast of "Hamilton." What’s the big deal about “Hamilton”? 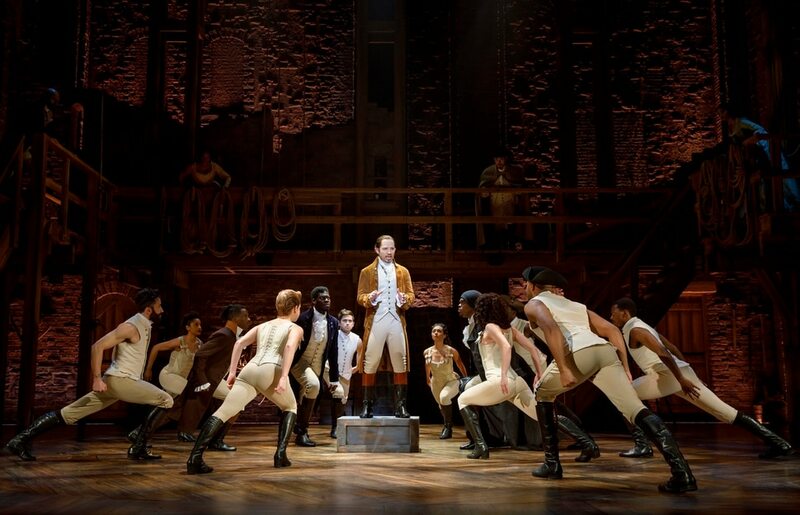 • The musical about the “ten-dollar founding father” is noted for its contemporary vernacular and successful blend of hip-hop and R&B within a classic musical-theater storytelling structure. • It’s innovative in featuring actors of color playing the passionate American revolutionaries. • The female characters also get a lot of great songs, including a lyric request that Thomas Jefferson include women as equals in the sequel to the Declaration of Independence. • The show was nominated for 16 Tonys, winning 11, in 2016. • Lin-ManuelMiranda, the writer and star, rapped his Best Musical acceptance speech on a night he lost the best acting award to his co-star Leslie OdomJr., who portrayed Aaron Burr. • It’s arguably the fastest-paced musical in history at 144 words per minute, according to the statistics blog The Five Thirty Eight — which calculated that if “Hamilton” were sung at the pace of a normal musical, it would clock in at four to six hours. • The musical won the Pulitzer Prize for Drama, and the annotated script was a best-seller. 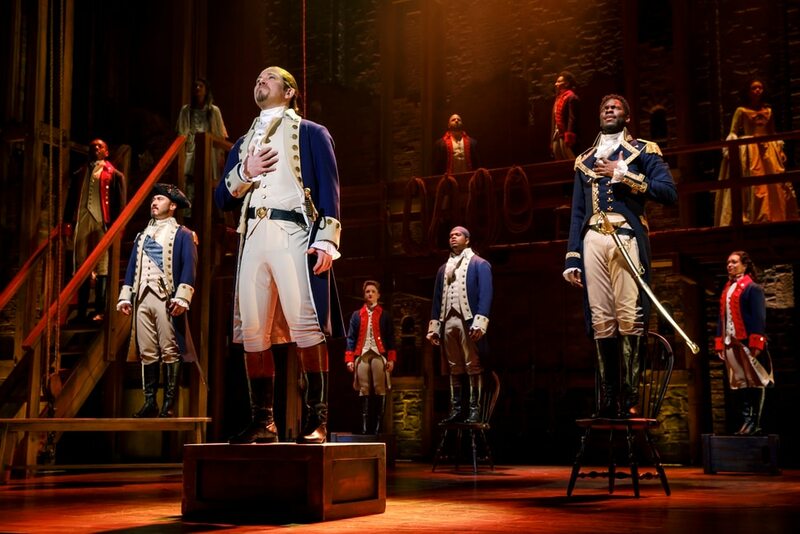 • The show also gave the biography that inspired it, Ron Chernow’s “Alexander Hamilton,” another ride on the best-seller list. • The Broadway cast album won a Grammy Award. • Together, all of this “Hamilton” hype even helped to keep its namesake’s portrait on America’s $10 bill. 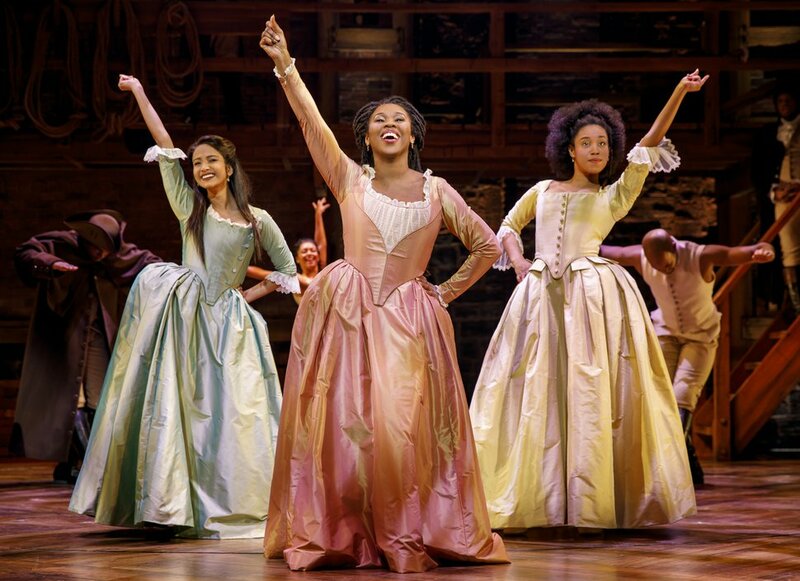 (Courtesy photograph by Joan Marcus) Ta'Rea Campbell as Angelica Schuyler, Shoba Narayan as Eliza Hamilton and Danielle Sostre as Peggy Schuyler/Maria Reynolds. The Salt Lake City run is sold out, but check artsaltlake.org/events for late-release seats or apply for the daily digital lottery or look for tickets on the secondary market.